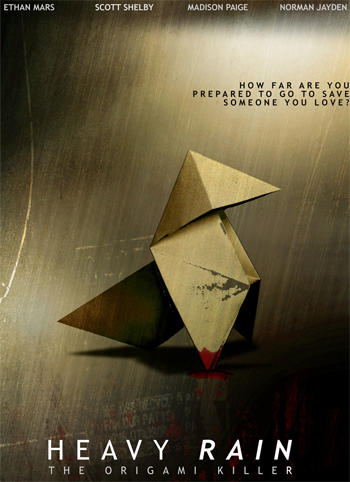 Heavy Rain is about normal people who have landed in extraordinary situations. I wanted a much more personal story. The first thing that came to my mind, as a father of two little boys, was that the main theme should simply be a father’s love for his son. This is not a game about saving the princess or the world. Its purely about a father’s love. The main story will revolve around four different characters, and we’re putting the spotlight on their perceptions. The question ‘what is good and what is evil’ is the key here, that will be just a matter of viewpoint…I believe heavily in moral choices, I’m going to use them A LOT. They’re not about being good or bad, but about finding the right balance. Don’t get fooled by the poster. Heavy rain is a game, not a movie. Anyways, really looking forward to this game. Looks and sounds like a really unique experience. I really like those kind of adventure drama kind of games. As in there aren’t many good ones out there or many to choose from, but I’ve enjoyed games that storytell for most. Combat etc is all minor within the game and the main thing is how the story is executed and how well it is written. Another thing to comment would be the amazing graphics. I don’t know about you but the animations of the characters all seem so real and fantastic. The emotions can be felt instantly as soon as the character meant to express one. It is simply fantastic. Yeah and if you watched the video you will realise how much the developer harp on the fact that this game is for adults, as in maybe adults would enjoy the game better and I believe thats kind of true. People who hate storytelling, think the storyline of a game don’t mean anything would probably not enjoy the game. So for now, enjoy the special presentation meant for the japanese people. Amazing stuff.